I took a quick trip to Los Angeles over the weekend, and despite the fact this it was incredibly brief, I was able to make a trip to the Getty Center. There was an exhibition showing there called California Video, which I highly recommend you check out if you’re in the Los Angeles area! This exhibition reveals the variety of artistic experimentation that has occurred in the video medium throughout California over the last 40 years. Video has grown to be one of the most common media used by contemporary artists, and Greater Los Angeles, San Diego, and the San Francisco Bay Area have been among the world’s most important centers for its development. 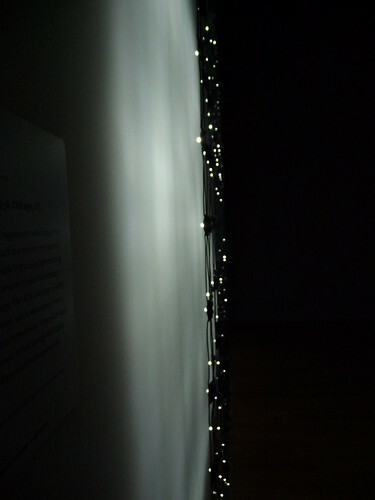 My favorite piece in the exhibition was “Home Movies 920-01” by Jim Campbell. From a distance, it looks like a blurry projection of someone’s home movies. However, on closer inspection, you realize that it isn’t a projection at all, but rather a grid of LED lights pointed at the wall and programmed to display video. See it in person if you can, but if you can’t, most of the videos are available for viewing on the Getty site here. California Video runs March 15th – June 8th, at the Getty Center.